Degenerative disc disease is one of the most common causes of low back pain and neck pain. The process is also termed as degenerative disc disorder. Degenerative disc disease can greatly affect the sufferer’s quality of life. Disc degeneration is part of aging and is not a problem in most people but in certain individuals, a degenerated disc becomes the cause of chronic pain. Degenerative disc disease most commonly occurs in the cervical spine or the lumbar spine, as these areas of the spine have the most motion and therefore are most susceptible to wear and tear. Degenerative disc disease may sound like a progressive threatening disease but it is not so. First, the degenerative disc disease is not really a disease at all, but rather a degenerative condition which could become the cause of pain. Secondly, though the degeneration of the disc may worsen further, this does not apply to symptoms, which may, in fact, get better with time. Depending on the region affected, the degenerative disc disease could be lumbar degenerative disc disease or cervical degenerative disc disease. Intervertebral disc undergoes many age-related changes. By the third decade of life, the nucleus pulposus becomes replaced with fibrocartilage, and the distinction between the nucleus and the annulus becomes blurred. The proteoglycan, water, and noncollagenous protein concentrations decrease. Collagen concentration increases, more so in the nucleus and in the posterior quadrants of the disc. While sagittal alignment, facet joint arthritis, and genetics potentially play a role in intervertebral disk degeneration. Following factors have been associated with increased rate and intensity of degeneration of the disc. Degenerative cascade was described by Kirkaldy-Willis and is the widely accepted pathophysiologic model describing the degenerative process. This process occurs in three phases that comprise a continuum with a gradual transition. The duration of the stages varies greatly, and distinguishing the signs and symptoms from one stage to the next is difficult. In this stage, there is a pain in the back or neck [depending on the disc region]. Movements may be painful. The site may be tender, muscle spasm may be there and the movements may be decreased. There is no neural deficit. Symptoms are similar to the previous stage. In addition, the abnormal movement may be seen on inspection and palpation. A catch or shift when standing erect after flexion may be observed. Progressive degenerative changes lead to osteophyte formation and stenosis. The severity of back pain decreases. Muscle tenderness, stiffness, reduced movement, and scoliosis are present. The pain associated with degenerative disc disease is thought to be due to inflammation and abnormal micromotion instability. As cartilage is the source of disc nutrition, erosion of cartilage is thought to lead to degenerative cascade leading to the inflammation and micromotion instability, which in turn causes pain. As it goes through the process, the disc space will collapse. Pain is the foremost symptom in patients of degenerative disc disease. It is usually associated with activity and can flare up in between. There is a baseline level of pain may vary between individuals and range from minimal pain severe and disabling pain. Activities like sitting in lumbar degenerative disc pain may make the pain worse as in the seated position the lumbosacral discs are loaded three times more than standing. If the pain is continuous and severe, other diagnoses must be considered. It must be emphasized that the amount of pain does not correlate to the amount of damage in the spine. Severely degenerated discs may not produce much pain at all, and discs with little degeneration can produce severe pain. Antinuclear antibody for screening autoimmune disorders. The role of imaging studies in degenerative disk disease is to provide accurate morphologic information that can be combined with clinical symptoms to guide therapeutic decision making. MRIs is accurate, reliable, and detailed anatomical information in degenerative disc disease. MRI reveals disc dehydration, also called disc desiccation, and often referred to as a dark disc or black disc, because a disc with less water in it looks dark on an MRI scan. It also shows annular tears and disc bulges. In the absence of MRI, CT scanning is accurate in diagnosing disc herniations, though it is not as sensitive and detailed for neural tissue visualization as MRI. But it is not as expensive and could suit claustrophobic patients. CT tells bony details better and is the gold standard for assessing bony fusion integrity after fusion. This procedure, controversial though, is valuable in determining if a particular disc is a source of pain or not. The procedure involves, injecting contrast material. 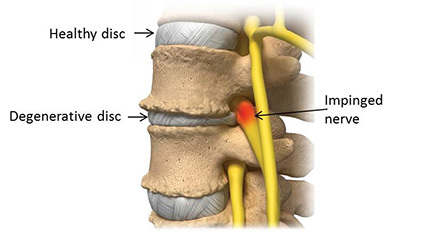 In contrast to normal disc, the pressure of the injected contrast material provokes pain due to the pressure of the contrast material reaches the part of the disc in contact with the nerve root. CT discography can determine if a disk herniation is contained, protruded, extruded, or sequestrated. A combination of imaging modalities may be necessary to evaluate cervical stenosis and nerve root compression adequately. This can be used as the diagnostic tool and therapeutic intervention for lumbar spinal stenotic levels. In the case of multilevel discs on MRI, this block can tell if a specific nerve root is affected. The procedure involves the injection of anesthetic and contrast at the nerve root level of interest under fluoroscopic guidance. This creates an area of hypoesthesia in the respective dermatome. This focuses on achieving enough pain reduction to enable the patient to pursue a specific exercise and rehabilitation program. As pain is usually caused by both instability and inflammation, both of these factors should be addressed. Most of the patients are treated by non-operative means. Patients who do not get better with nonsurgical approaches may be considered for surgery. The operative solutions, a fusion or artificial disc, are extensive surgeries and patients are usually advised to make a serious effort with nonsurgical treatments for at least 6 months prior to considering surgery. Once the patient can be, she is put on exercises and rehabilitation. Exercises help the back heal and prevent or reduce further recurrences of pain. A release of endorphins during exercise also works to serve as the natural pain reliever. Exercise is best done under professional supervision. These include muscle relaxants, nonsteroidal anti-inflammatory drugs, and analgesics. Epidural steroid injections are most commonly used for therapeutic purposes. The response to epidural injections is variable, and are only of short-term value. No more than 4 injections should be given annually. Ice packs, heating pads, electrical stimulation, phonophoresis, iontophoresis, relaxation, and biofeedback. Lifestyle changes aim at avoiding stress on the spine and inculcate habits of right posture and ergonomics. Avoid staying in one position for too long. It is better to stand up and stretch and walk around every 20 to 30 minutes instead of sitting for a prolonged period. The goal is to teach patients how to help themselves manage their back pain. Dedicated education programs teach the patients better. Getting in and out of a car, and sitting in a car. Relaxation exercises are good for relieving muscular tension that may aggravate back pain. Surgical treatment is used in about 5% of patients and includes lumbar surgeries and cervical surgeries. Surgeries for degenerative disc need to decompress the nerve root by either removing the offending structure [disc] or create more space so that the disc does not impinge on the nerve root. The second part of the surgery is fusion which aims at removal of motion between two vertebrae and thus decreasing the pain generated from the joint. This involves using a bone graft to fuse one or more vertebrae and stop motion at a painful vertebral segment. Fusion is almost always accompanied by fixation surgery. In fact, the actual procedure includes fixation first and fusion later. The fixation is required to hold the vertebrae in immobilized position till they fuse. Various implants used for fixation are pedicle screws, plates, anterior and posterior body cages. First procedures for lumbar spine are discussed, then cervical spine. Only a brief outline of the procedures is mentioned as they would be discussed separately in greater details. Usually, the fusion and decompression are done in the same sitting, using the same approach. It involves removal of the affected disc through the posterior approach. The offending structure is removed which relieves the nerve of the pressure. It is done for central and lateral stenosis at one level and involves minimal removal of lamina for enlarging the canal. This is done in cases of for central and lateral stenosis at several levels and involves removal of the lamina at the desired levels. This type of spinal fusion involves placing bone graft material in the posterolateral portion of the spine. Bone graft is harvested from the posterior iliac crest. For better chances of fusion, immobilization is done and smoking should be stopped. Posterior lumbar interbody fusion achieves spinal fusion by inserting a bone graft directly into the disc space through posterior approach after removal of the disc. Anterior lumbar interbody fusion is similar to posterior lumbar interbody fusion except that approach is anterior. Transforaminal lumbar interbody fusion (TLIF) has become an increasingly popular treatment for lumbar degenerative disk disease, spondylolisthesis, degenerative adult scoliosis, spinal stenosis, and recurrent disk herniation. The approach to the spine is posterior. TLIF is a modification of PLIF. This procedure has been used for lumbar discogenic pain, with and without radicular symptoms. Artificial disk replacement has shown results similar to fusion in the short term, but long-term results are not known. Surgeries in degenerative discs depend upon presence or absence of cervical myelopathy. In absence of cervical myelopathy, the goal of surgery is to adequately decompress the nerve roots. The goal of surgery for degenerative cervical disc disease with myelopathy is to decompress the spinal cord adequately. ACD involves performing a decompression of the nerve roots through an anterior discectomy. The discectomy may be considered for patients with normal cervical lordosis, minimal axial pain, and abnormalities limited to 1 level. Addition of fusion avoids recurrent radiculopathy from foraminal narrowing and the risk of kyphosis from disc-space collapse. Plating is generally added for immobilization, especially in multiple level involvement. Nerve root decompression may be accomplished posteriorly by performing a foraminotomy This is used most commonly in soft posterolateral disk herniations. Cervical laminoplasty It involves osteoplastic enlargement of the spinal canal by performing the laminectomy on one side to create a door. Severe medical or psychological issues. Thanks, it is very informative, rather beyond.